For the last quarter the majority of Sunday evenings have seen futures fall sharply. Today is no exception with the S&P futures down 9 points. After four weeks of gains and with the market closed on Monday, I am not surprised there are some sellers. Helping to poison sentiment on Sunday was news the Chinese economy grew at 6.6% for 2018. That was the slowest official growth rate since 1990. The 2017 rate was revised down to 6.8%. Q4 GDP was 6.4%, down from 6.5% in Q3. These are the government numbers and almost nobody believes they are correct. For years analysts have claimed a significantly lower number. There are economic numbers that are nearly impossible to fake while others prepared by the government are easy to embellish. By taking those hard numbers and extrapolating based on historical trends, the GDP could be as low as 2% growth. Analysts believe China is slowly managing the GDP numbers to decline a point or two every quarter until they eventually arrive at the correct level. By publishing only a minor decline every quarter they are preventing an ugly knee jerk reaction by the market. The internals today clearly show the impact of the trade war. China is trying to manage growth by applying stimulus including easier access to credit and even some Trump style tax cuts for businesses. However, as much as 25% of outstanding loans are nonperforming. They can't afford to write them off because that would decrease the book assets in the banks and prevent new loans from being written. In this simplified example if a bank's allowable loan to assets is 75% and they have $1 million in assets, that allows them to loan $750,000. If they had to write off $200,000 in bad debt then their loan limit would be $562,000 and you could not write any new loans until the loan balances declined below that $562,000 level. Eventually this exercise will have to be done but it will be very painful and could put China into a recession. China is slowly raising the limit on available loans by reducing the amount banks must hold in reserve. This is good for the economy but bad for the banking system because it allows the bad loan infection to grow. The news from China tanked the futures but they have come back slightly to -5 as I typed the paragraphs above. The market is closed on Monday for Martin Luther King Day. Some of the reports listed on the calendar may not appear because of the shutdown and the impact on government agencies but I listed them anyway just in case there is a breakthrough in the standoff. The US and Chinese trade delegations will meet again in two weeks. I do not have the exact date, so I did not put it on the calendar. While they could reach some agreements, nothing will happen until Trump and Xi meet again so both can get their Kodak Moment signing the agreements. March 2nd is the date the US tariffs on China rise from 10% to 25% so expect an agreement before March 2nd. Earnings intensity increases next week with a bit more diversity in the company's announcing. IBM and Intel will be the biggest tech stocks followed by several chipmakers. Starbucks reports on Thursday. Other Dow components include JNJ, PG, UTX and TRV. Some 55 S&P companies have reported Q4 earnings with average growth of 14.2%. More than 76% have beaten analyst estimates. Revenue growth has averaged 5.6% with 58.2% of companies beating estimates. The current forward PE is 15.4. There are 60 S&P companies reporting next week. Historically the actual earnings growth ends the quarter about 4% higher than the estimates at the beginning of the cycle. That would put Q4 earnings growth in the 18% range if the trend continues. We will track this as the cycle progresses. The Dow and S&P both closed within only a few points of their 2017 close. 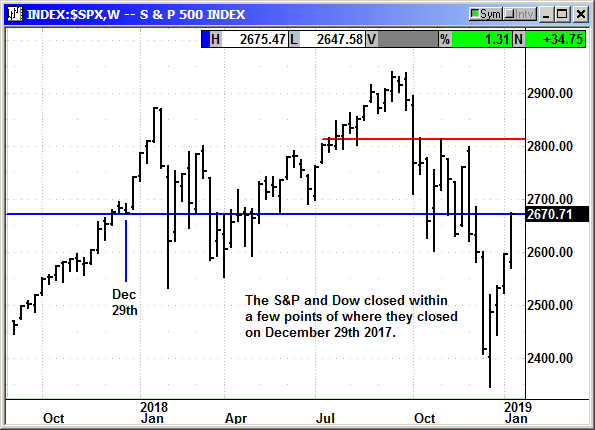 The S&P closed at 2,673 on December 29th, 2017 and 2,670 on Friday. The Dow closed 2017 at 24,719 and closed on Friday at 24,706. For both indexes to be so close to their 2017 levels at the same time is remarkable. All the volatility of 2018 is hopefully behind us. 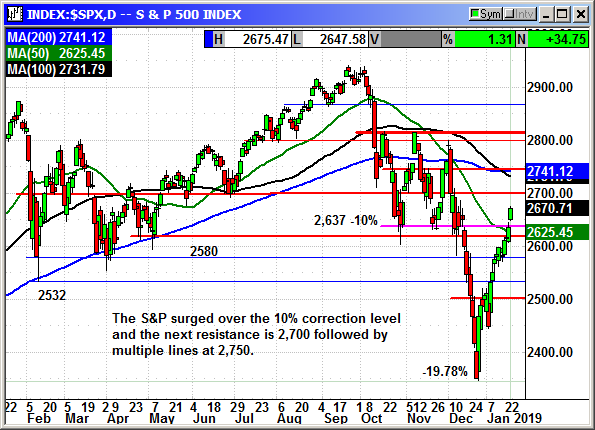 The S&P surged over the 10% correction level at 2,637 and appears to be headed for round number resistance at 2,700 followed by the convergence of multiple resistance lines at 2,750. The ultimate test will be 2,800. Once over 2,700 that higher target will become a magnet for investors and could prompt a sell the news event when reached. 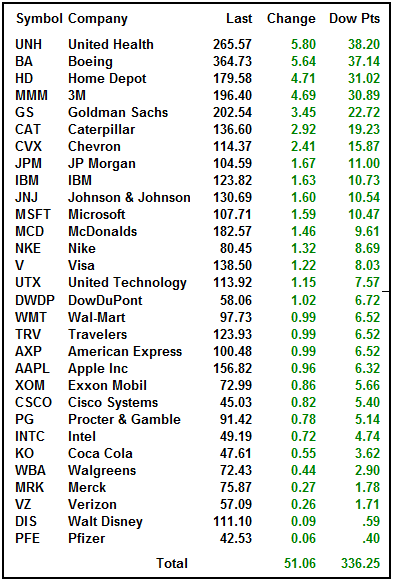 The Dow had a great day on Friday with all the tariff sensitive stocks posting strong gains. Unfortunately, the China news story is going to fade before we get any real data. The next trade meeting is not for two more weeks. Minor details may leak out, but any real deal will not occur until Trump and Xi meet again to sign any deal and get their pictures taken for the consumers at home. 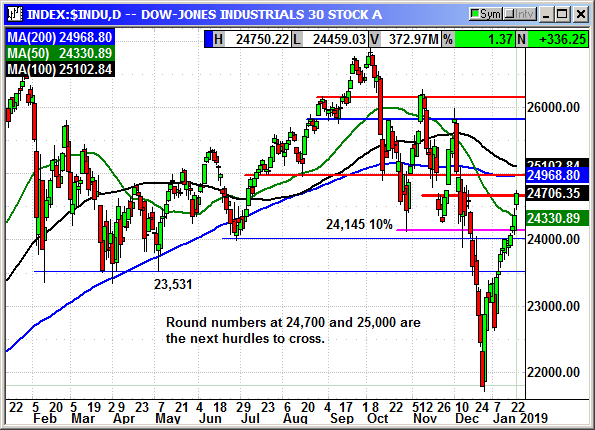 The Dow eased over minor resistance at 24,700 by only 6 points so that level is still in play. The real hurdle will be 25,000 and the convergence of the 100/200 day averages and the horizontal resistance since July. After the big run over the last four weeks, the Dow is very overbought and continued gains could be rocky. 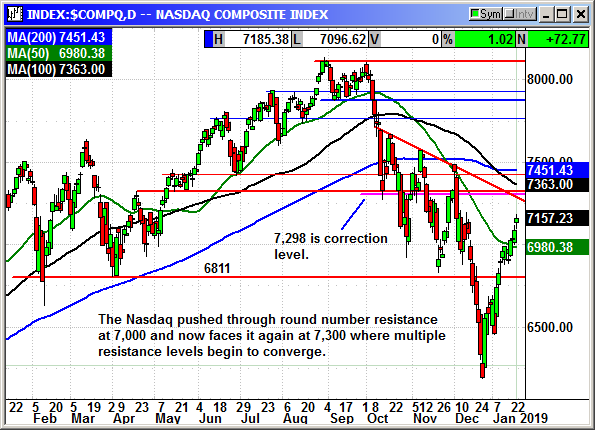 The Nasdaq has yet to regain the 10% correction level at 7,298 and there are multiple types of converging resistance at that level. The downtrend resistance since October and the 100-day average as well as the round number resistance at 7,300 should make that a volatile location. 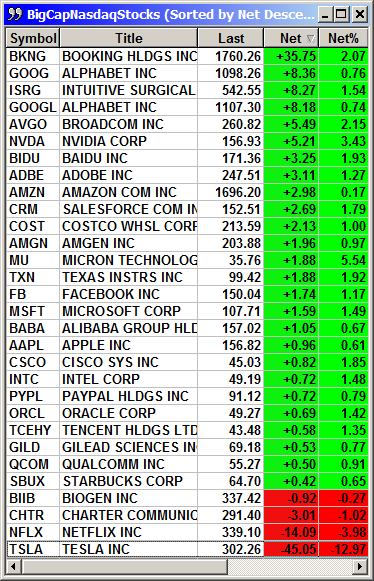 The big cap tech stocks have been mostly positive for the week and the index gained 2.6% so it was a good week. The techs are lagging the big cap indexes because of weakness in the chip sector, thanks to Apple. 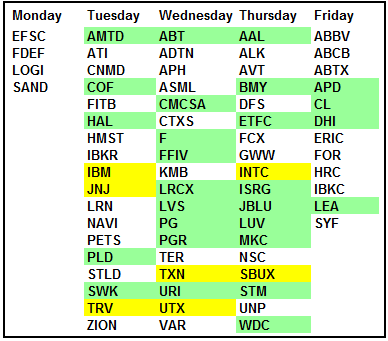 There are only a handful of tech stocks reporting next week so the following week is where the tech earnings will flow. 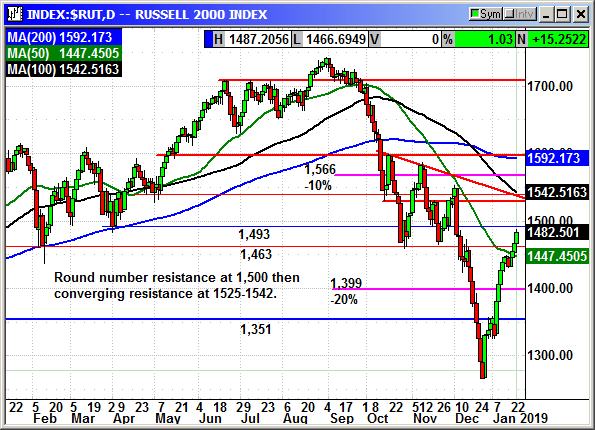 The Russell had a good week after a slow start. After three weeks of gains it went through several days of consolidation before surging ahead. The lack of a rate hike threat and the potential for a trade deal helped encourage fund managers it was safe to buy small caps again. 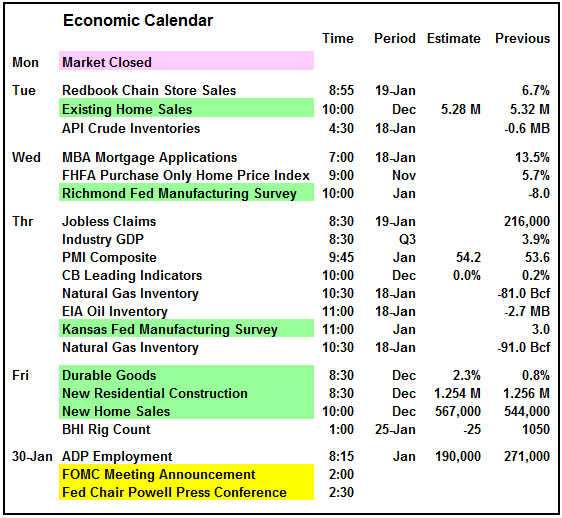 Just how bad was the market crash in Q4? Investors pulled a record $143 billion from actively managed funds in December alone. That brought the total for the year to -$301 billion and just below the record of $320 billion in 2016. Passive funds and ETFs gained $60 billion in December as investors fled to a cheaper, longer term investment. Passive index funds have risen to $6 trillion in assets while ETFs have risen to $3.6 trillion in assets. Investors are losing faith in fund managers since most did not beat the market in 2018. While I believe the market is going higher, we have had a four-week rally and the Dow is very overbought. We are at risk for a post earnings consolidation period. Since tech earnings are still a week away that should get us through this week without any major decline. Expectations are still in play. Several high-profile earnings misses or warnings could easily kill those expectations but investors have been buying bad news. I would continue buying the dips until we are proven wrong.